For weeks local chefs have been slicing Colorado tomatoes into their salads and peaches over their desserts. But they’ve been doing it kind of undercover, using only their menus to mention the origins of their produce. But last Saturday, Harvest Week kicked off, and Denver restaurants’ weeklong celebration of late summer product reminds us that Colorado peaches, Olathe corn, and Torpedo Farms Pork are all worth more than a simple menu mention. The 36 restaurants involved in Harvest Week have designed entire meals around local products, and through Friday, they will be serving up dishes dedicated to Colorado food. Table 6, for example, is serving a smoked Colorado trout brandade (think salmon cake, except trout) made of all Colorado products. Root Down kicks off its menu with Rocky Mountain cantaloupe and tomato gazpacho. These dishes, and the many more like them featured during Harvest Week, are worth celebrating for their Colorado ties, super fresh flavor, and culinary sophistication. 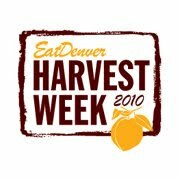 For a complete listing of Harvest Week restaurants or for more information on the event, click here.